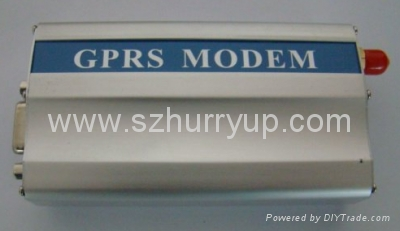 The modem based on wavecom Q2403A, Industrial design. Aluminum casing. Standard rs232 interface. Dual-band 900/1800mhz. 3v sim card slot. Sim application toolkit. Double tone multi-frequency function (dtmf). Send and receive data, fax and sms. Maximum transmitting speed 115kb/s. Antenna with high sensitivity. Always on-line. Comply with etsi gsm phase2+. Dual-band. Class 4 2w @ 900mhz. Class 1 1w @ 1800mhz. Input voltage5v-36v dc. Input current1a. Standby current: 5ma. Working current: 300ma. Group 3 fax (class 1 and class 2). Working temperature -20 -+55. Storage temperature:-25 -+70. Size85*54*25mm. Weight130g. Accessories: ac/dc adaptor, rs232 cable, antenna, 2 mounting plates, cd.